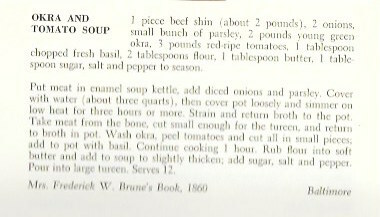 The following recipes come from a collection of recipes found in a manuscript journal located in the H. Furlong Baldwin Library at the Maryland Historical Society in Baltimore. The manuscript is attributed to Ann Maria Morris and the date of 1824 is written on the inside cover. The recipe below is one of many from the manuscript that will be included in a book I am writing. The book will contain biographical information about Mrs. Morris, an annotated transcript of the entire manuscript as it was written, and a section of modern recipe adaptations. To a gallon of water put 4 lb. beef, a peck of tomatoes ¼ peck of ochre, a green pepper—boil five hours, strain it. 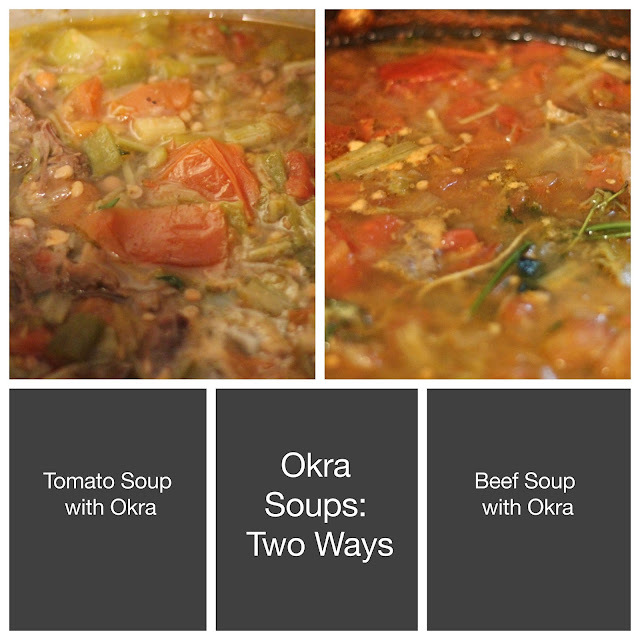 These two recipes are very similar in that they both have a base of beef stock and are rich in tomatoes and okra. The biggest difference between these two recipes is the proportion of ingredients used. Ironically, the recipe for Tomato Soup has more beef in it than does the recipe for Beef Soup. However, the recipe for Tomato Soup does, indeed, have more tomatoes in it than the Beef Soup recipe, but because it has a lot of okra and is cooked in a different way, the beef soup looks like it has more tomatoes! Okra (Abelmoscheus esculents, formerly Hibiscus esculentus) is a member of the mallow family and is native to Africa, most likely first cultivated around Ethiopia and in West Africa. At some point it made its way north to Egypt and was found growing near the Nile River in the 13th century. The name okra is West African. It may come from a West African term nkru ma or it may come from another West African term for okra which is gumbo. Not surprisingly, in America, the term gumbo means an okra-rich Creole stew from Louisiana. Okra's most distinguishing feature is its ability to release a gluey substance when cooked in a liquid which works to thicken the broth; hence, okra is often associated with being slimy. Fear not, this can be a good thing, not a bad thing. Okra was brought to the New World through the slave trade and can be traced to Brazil as early as 1658 and Dutch Guiana by 1686. It may have reached the southern North American colonies in the 17th century but was definitely in place there in the 18th century. The Swedish scientist Peter Kalm wrote about the okra he found in Philadelphia in his 1748 book Travels in North America and Thomas Jefferson even mentioned it in his Notes on the State of Virginia in 1785. According to Maryland food historian, Michael Twitty, in his work Fighting Old Nep: The Foodways of Enslaved Afro-Marylanders, 1634-1864, okra plays a definite part in Maryland food traditions. Twitty states, "While only about 10 percent of enslaved people coming to Maryland came from the Caribbean, it is likely that many of the Africanisms we perceive to have been brought directly from Africa to the Chesapeake--cayenne peppers, fish peppers, okra plants, and the like--were introduced from the enslaved communities of Barbados and Antigua." Additionally, Twitty goes on to assert that the Afro-Caribbean cooks who worked in the kitchens as cooks of the white ruling class were able to incorporate their tastes into the dishes prepared for those white people; thus, "many early white Marylanders . . . had a taste for Black New World Cooking." 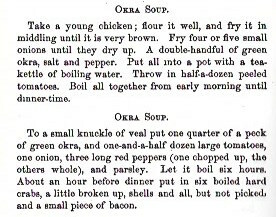 The recipes highlighted in this blog post for soups packed with okra were found in a manuscript booklet written by a white housewife from a 19th century wealthy slave-owning Baltimore family; this fact definitely confirms Twitty's theory. 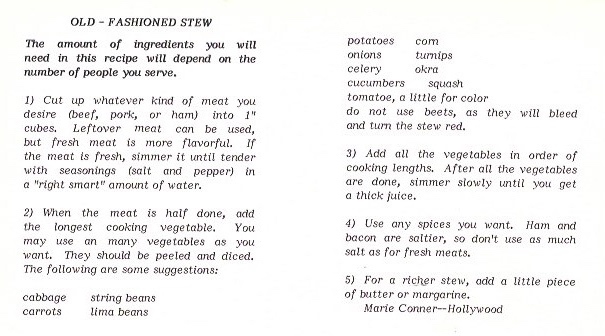 This recipe for Old Fashioned Stew comes from 300 Years of Black Cooking in St. Mary's County, Maryland published in 1983 by the St. Mary's County Community Affairs Committee. It contains okra, along with many other vegetables, including tomatoes. Here are modern recipe adaptations for both of Ann Maria Morris's two soup recipes containing okra. Pick your favorite! 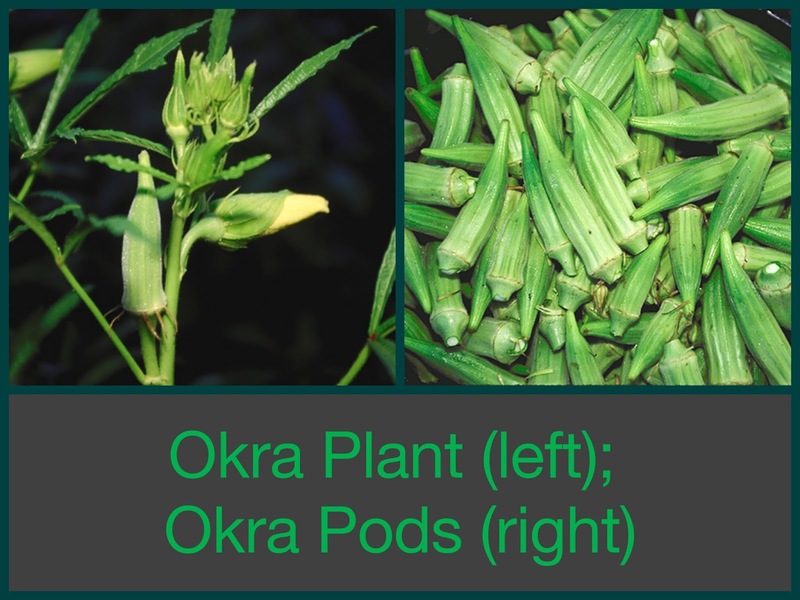 Prepare the okra by removing the stems and tips and cutting each piece into 1/2 inch chunks. Set aside. Place okra, beef, onion, bell peppers in a large stock pot and cover with 3 quarts of cold water. Add the salt, ground black pepper, and thyme. Stir. Set the pot over medium-high heat and bring to a boil. Remove any scum that rises to the surface of the water. Then reduce the heat to low, cover and simmer for three hours, or until the meat is tender and the stock has reduced to about 3 pints (6 cups). Remove the beef bones and make sure the beef is shredded up. Tie the fresh herbs in a bundle and add to the pot. Add the chopped tomatoes and increase heat until it reaches a boil. Once it comes to the boil, reduce heat to low and simmer uncovered for 40 minutes. Remove from the heat and discard the bundle of herbs. Adjust seasoning to your taste and serve immediately. Place okra, beef, bell pepper, and tomatoes in a large stock pot and cover with 2 quarts of cold water. Add the salt, ground black pepper, and thyme. Stir. Set the pot over medium-high heat and bring to a boil. Remove any sum that rises to the surface of the water. Then reduce the heat to low, cover and simmer for 3 1/2 hours, or until the meat is tender and the stock has reduced by half. Simmer on low for an additional 30 minutes uncovered. Remove the the heat and discard the beef bones and make sure the beef is shredded up. Remove the herb bundle. Schenone, Laura. A Thousand Years Over a Hot Stove, New York, 2003. Smith, Andrew. The Oxford Companion of Food and Drink in America, Second Edition, Oxford, UK, 2013. Twitty, Michael. Fighting Old Nep: The Foodways of Enslaved Afro-Marylanders, 1634-1864.